Step 363. 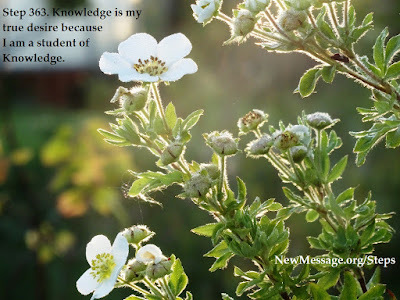 Knowledge Is My True Desire Because I Am A Student Of Knowledge. Knowledge is your true desire. Think not that your desires are false, for all desires, if recognized, are for Knowledge. It is because you have misinterpreted your desires or have attempted to use them to fortify other things that they have led you astray. Do not attempt to be without desire, for life is desire. Desire is purpose. Desire is meaning and direction. Yet, you must recognize your true desire, which is the desire for Knowledge to fulfill itself and to claim itself, the desire for Knowledge to save you and for you to save Knowledge. How can you save Knowledge? By holding it within yourself, by being a student of Knowledge, by carrying Knowledge everywhere you go, by reinforcing your awareness of Knowledge, by being simple with Knowledge and by not attempting to use Knowledge to fulfill your own aims and your own purposes. Carry forth the normal activities of the day, but carry Knowledge with you. If Knowledge is not in doubt, you need not be in doubt. If Knowledge is not afraid, you need not be afraid. If Knowledge is not changing the situation, you need not change the situation. Yet, if Knowledge holds you back, hold yourself back. If Knowledge changes the situation, change the situation. If Knowledge tells you to leave a circumstance, leave a circumstance. If Knowledge tells you to stay in a circumstance, stay in a circumstance. Here you become as simple and as powerful as Knowledge. Here you become Knowledge itself. Upon the hour repeat the idea for today and experience it. Within your inner life, experience it as well in your deeper meditation practices. Your inner and outer life are where you apply yourself and where you give yourself. They are where you carry Knowledge. In time, you will see that Knowledge will carry you. Practice 363: Two 30-minute practice periods. Hourly practice. June 19, 2014 Round One: It is okay to have desires as long as they are not selfish, ambitious and for my own gain. Is my desire to have a house in the country selfish, ambitious? I believe not, for I feel living in a natural environment will help deepen and strengthen my Knowledge, help me to carry it within me and also to carry it into the world. All I need to do is follow Knowledge, Knowledge sets all things to right, I just need to stay alert to the signs, what to do and what not to do. Thoughts come into my mind, thoughts that might lead to something greater if I pursue them and put them into action. Knowledge is my true desire, it is the driving, motivating force in my life. I understand “save” as it is used here not to mean “rescue” but to mean preserve, nurture, carry like a flame within me to be tended and not permitted to go out. My desire for Knowledge is my desire to reinforce my awareness of Knowledge, being simple with Knowledge, going with the flow. Ahhh, this is what I desire. August 11, 2015 Round Two: What I wrote yesterday fits perfectly with today’s Step. And it is interesting that last year I pondered on my desire to live in the country. Today, I am living that desire. I wish to just sink into the experience, without analyzing and intellectualizing it. I wish to live each day as it comes, experiencing Knowledge and carrying it within me. This is what I am striving for. Knowledge is indeed my true desire. I am not claiming any particular accomplishments here, however. I was thinking today that as an individual I have so many flaws. There are so many things I could improve about myself in mind and body. I don’t even really know if I have made any spiritual progress. Sometimes I think it is all words, theoretical, with nothing to show for it in practice. I keep trying though, I keep learning to learn, for I am a student of Knowledge.